Cauvery Dispute: Supreme Court Increases Karnataka’s Share of Water, Reduces Tamil Nadu’s. The Supreme Court today directed the Karnataka government to release 177.25 tmcft of Cauvery water to Tamil Nadu from its inter-state Biligundlu dam. The judgement clarified that Karnataka will now have an enhanced share of 14.75 tmcft water per year while Tamil Nadu will get 404.25 tmcft, which will be 14.75 tmcft less than what was allotted by the tribunal in 2007. Earlier, in accordance with the 2007 award of the Cauvery water dispute tribunal, Karnataka had a share of 270 tmcft of Cauvery water. This will now increase to 284.75 tmcft. 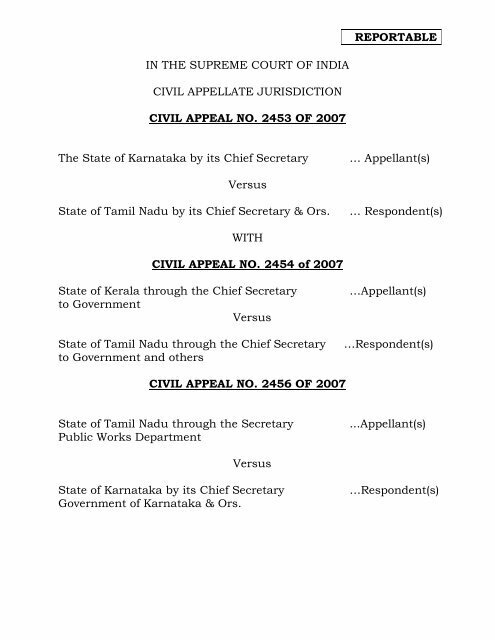 The much-awaited judgement was pronounced by a bench comprising Chief Justice Dipak Misra and Justices Amitava Roy and A.M. Khanwilkar, which had on September 20 last year reserved the verdict on the appeals filed by Karnataka, Tamil Nadu and Kerala against the 2007 award of the tribunal. 370 witnesses had also deposed to.